It has been a weekend of firsts. The weather forecast and tides were right, so we made our first proper “passage”. Saturday was bright and clear with NW F2-3 winds. 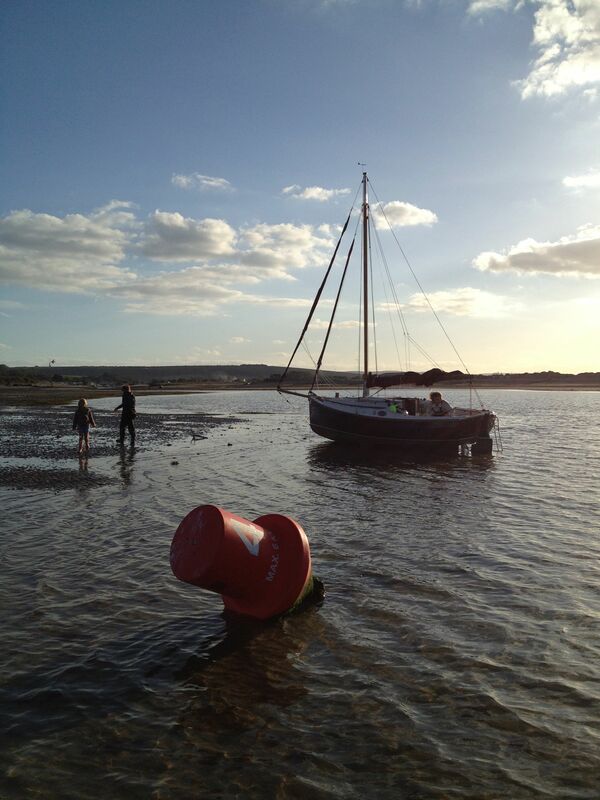 We made a leisurely start from Northney- a good launch from the busy slipway. 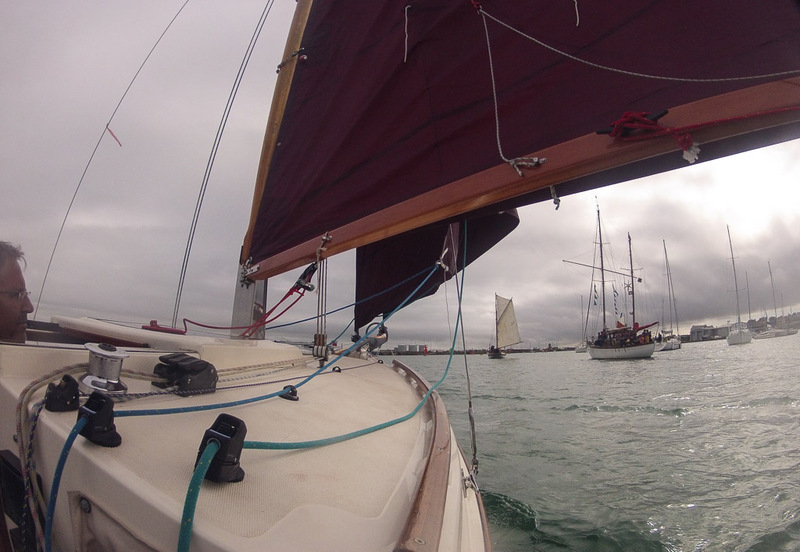 The run down to Hayling Island Sailing Club was comfortable and the turn towards Bembridge gave us a pleasant reach on main and staysail. However, I did not make sufficient allowance for the tide, which turned during the passage and put us down tide of the harbour entrance. After about 40 mins of beating we passed the Martello fort which stands at the harbour mouth. The chart shos the entrance of the harbour as drying, but our information was that access was available at all states. The channel marker is not much use here! We had strayed to the edge of the channel and though we draw very little, there was not enough water for us to float and no amount of swinging from the shrouds would shift us. Well I always wanted to find out what it what it is like to take the ground! It was a sunny calm afternoon and we had plenty of supplies. A new kind of beach holiday! We had lots of fun splashing about and hunting for critters in the sand. However, our wait was not the 4 or so hours I expected, thanks to the rather unique tidal curve in the Solent. The water having dropped away started coming back up again, an hour or so before low tide and we were able to motor into harbour easily enough, though with due respect to channel markers and depth sounder. 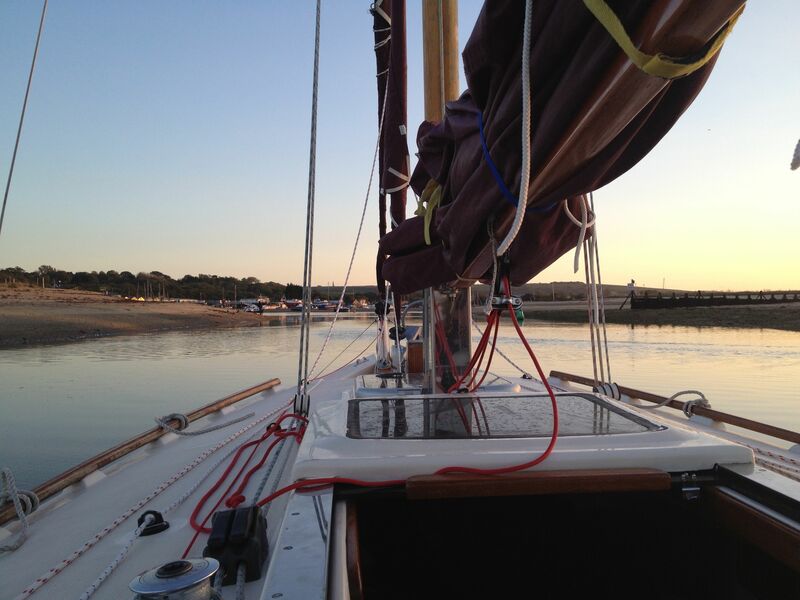 Bembridge is a pleasant spot and we were soon rafted up and directed to a nice pub meal. Sunday was forecast F4-5 SW and it dawned overcast with little wind. Casting off at 9am, we motored out and hoisted main and Yankee. Sadly, we could not sail deep enough to make the entrance to Chichester, so we ran on increasing SWerly towards Horse Sand Fort, shortening to main and staysail. After a tidy gybe, we ran in company of another gaffer and furled the staysail in the steadily increasing breeze (F6 by now). The motion was not very comfortable, though Aurora made excellent time. The gybe at West Pole was very exciting, well controlled with Niki hauling the main sheet and myself on helm. This new direction was exhilarating as we surfed down the swell (the GPS peaked out at 9kts!! ), but we were pretty glad to get inside the harbour. Our first overnight passage was completed with a reach back to Northney on reefed main and an (almost) uneventful recovery. 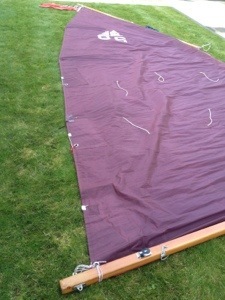 We managed to lose a batten during our trip to Anglesey so I brought the main sail home to measure up for a new one. At the same time, I’m thinking of how we can fly our ensign. 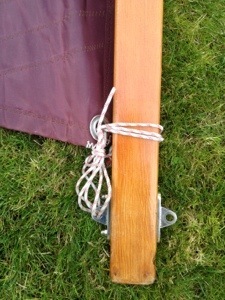 I am favouring attaching it between gaff end and an eye part way down the leach of the main sail. 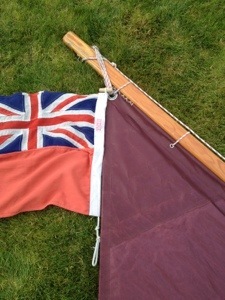 I also have to figure out how I can make the out haul adjustable, as this would make sailing in heavier winds more manageable and save “ragging” the main (which is what contributed to the loss of the batten). 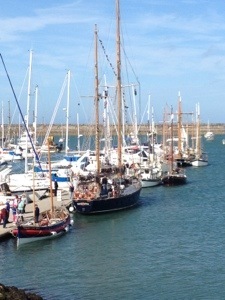 Last weekend saw the Traditional Boat Festival, organised at Holyhead in Anglesey by the North Wales Old Gaffers Association. We’d never been to anything like it before and we had a ball! Friday night kicked things off with a civic reception. Aimee was spotted by the live folk(ish) band and encouraged to join in on percussion. She also enjoyed having a real pirate parrot on her shoulder! The main event for Saturday was a “race”, which we had no intention of doing more than following the course. The F6 made us quickly throw in a reef, but with the kids aboard, I didn’t fancy the long beat home, so we retired fairly early in the downwind leg (as did many others!). This excitement was rounded off by an excellent meal at Holyhead sailing club, some live music and picking up cruising tips from the locals. Sunday dawned sunny with light winds- the best weather of the holiday. Perfect for the parade of sail with all the other gaffers, complete with water fights and live cannon fire! 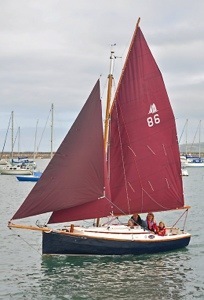 The girls had a whale of a time and we made fine progress in the flotilla, thanks to Niki’s excellent helming. 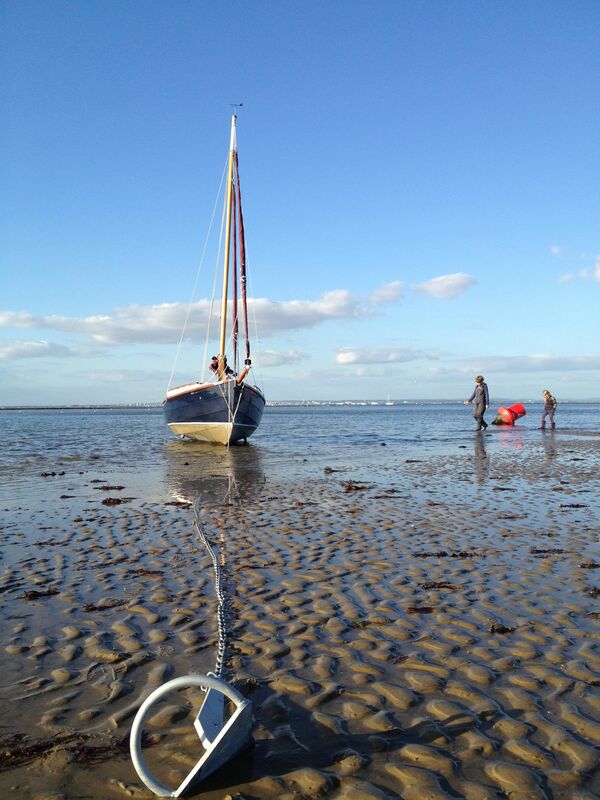 The weather was so nice, I decided to go for another sail in the afternoon with Russell, Trevor and Stefan. We reached across to Church Bay, anchoring from sail and then reaching back again (though progress was a little slow in the light airs). Meanwhile the girls attended the prize giving and were absolutely delighted to each win a “youngest crew” prize. All in all a fabulous weekend and a brilliant advert for the Old Gaffers Association.